Tim has been combing craigslist for the past six months looking for some inflatable kayaks that we can haul to the lake on the Xtracycles. 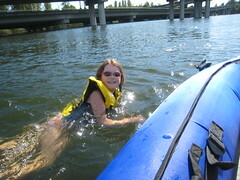 We used to own sea kayaks before we had kids but sold them a few years ago. Loading and unloading the kayaks on the car and driving a mile to the lake was never worth the effort for us and we didn’t use them that often. It wasn’t that hard for us to let them go. Still looking for a way to escape the beach crowds during the warm summer months, inflatables that can be hauled on the bikes seemed like a good solution for our summer boating needs. These inflatables aren’t going to get us to the San Juans, but are perfect for floating around the lake with the kids on a hot day. The stars aligned this weekend and a great boat, pump and life jackets came up on craigslist in Fremont, a perfect bikable distance for the whole family. We pedaled down and picked them up and took our maiden voyage on Sunday, a beautiful warm summer kind of day. All in all, getting the boats and the whole family to the lake was easy! Tim hauled two boats on his bike. I hauled the jackets, paddles and beverage and lunch laden cooler and the kids pedaled their own bikes. We pumped up the boats and launched them in the water in no time at all. The rest of the afternoon was spent floating, checking out birds and turtles and an impressive beaver dam, counting dead fish, eating, drinking cool beverages and swimming. All in all a great day. Looking forward to more kayaking fun this summer. 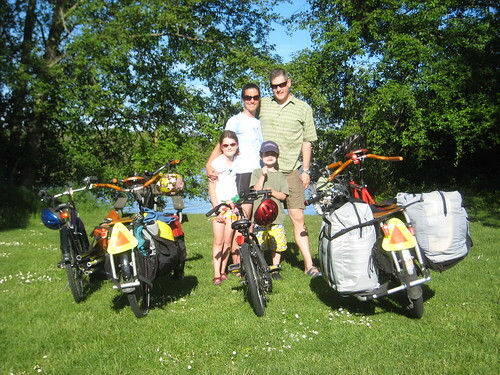 This entry was posted in alternative transportation, BIG Loads, bikes, cargo bikes, extravehicular activities, kids, xtracycle and tagged bikes, kayaking, kids, summer, sun, xtracycle. Bookmark the permalink. That was fun. Let’s go again _now_. Wait a minute, this doesn’t make sense… how can hauling two kayaks a mile to the lake on a car be too much trouble but biking to the lake with inflatable kayaks and then having to inflate them is no trouble? If you notice, I said it wasn’t “worth the effort” to drive. 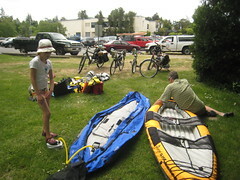 And that’s the point…riding bikes with the inflatable kayaks isn’t an effort (for us) it’s part of the adventure. Perfect!!! That looks like the dream day to me! I live about 2-3 miles from a kayak rental and am waiting for the time that my littlest is old enough to go kayaking on the river and then bike there. I think the time is actually now/soon. Can’t wait! Anne and Tim didn’t even brag that even after such a lovely, full day they still had the energy to welcome a new neighbor to their ‘hood – with fresh muddled mojitos and steak, asparagus and taters on the BBQ! Thanks, guys!!! I stumbled across your blog and love it! This is proof a family CAN function without relying on a car. I applaud all of you! I have considered getting an extra cycle for my own urban adventures. Reading all the info you guys have given here made the decision easy. I’ll do it when I have enough money. Thanks so much for sharing. I look forward to reading more and more about the adventures of a car free family. Thanks. Pingback: Kayaking Today » Blog Archive » Latest kayaking news – Let’s go Kayaking ….